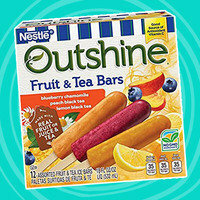 These treats are a little like the Arnold Palmers of the fruit-pop world! If Peach Black Tea (my favorite! ), Lemon Black Tea, and Blueberry Chamomile frozen bars don't sound incredibly refreshing, we're not sure what does. In addition to these slender 35-calorie pops, they come in a larger 60-calorie size. Find them at major retailers. Bonus: There's a Tangerine Ginger Ginseng flavor available exclusively at Target! 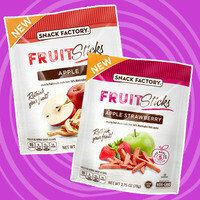 Sometimes you want the sweet and tangy taste of fruit, but in a crunchy snackable form. These new French-fry-shaped dried snacks are perfection -- no sugar added! Try them in Apple, Apple Strawberry, and Apple Cinnamon. Find them at Walmart, Kroger, Giant Eagle, Hy-Vee, Save Mart, and more, or order on Amazon. Have you heard? Skinny Cow products now have shorter ingredient lists with fewer unfamiliar ingredients, and the milk now comes from cows not treated with the growth hormone rBST. Cool! 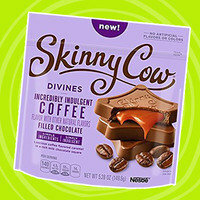 Along with the overall changes, Skinny Cow has rolled out these slim chocolates filled with coffee confection. Yum to the max! Now available at Target and other major retailers. Calling all weight-loss success stories... Time to step into the spotlight! Hey, Hungry Girl fans! Have you lost a significant amount of weight and kept it off, thanks in part to Hungry Girl? Send us some details along with before & after photos, and you could be featured in a brand-new national Hungry Girl magazine! Inspire others, show off your hard work, and share your best tips 'n tricks... What are you waiting for? Go gather those photos, and email us ASAP! Think before you chew: 10 foods that could raise or reduce your risk of death. A recently published study has revealed some easy-to-digest (no pun intended) info about the foods you should be eating. When examining cardiometabolic disease (like heart disease, stroke, and type 2 diabetes), a high number of preventable deaths was linked to either eating or not eating certain foods. The items you should be eating? Nuts and seeds, seafood rich in omega-3s (like salmon), vegetables, fruits, whole grains, and polyunsaturated fats (like the kind found in olive oil). And the top foods to avoid are salt, processed meats, sugary beverages, and red meat. We can't argue with that! Gluten-free warning... A low-gluten diet may be linked to higher diabetes risk. If you're cutting out gluten but don't have celiac disease, be cautious. New research suggests that eating gluten-free products may be connected to a higher risk of developing type 2 diabetes. The speculated cause is that foods formulated to be gluten-free tend to contain less dietary fiber and fewer nutritious micronutrients than their gluten-containing counterparts. Eeeks! Stay aware, and make sure you're getting the good stuff from somewhere. Happy March 27th, National Spanish Paella Day! You do know about our delicious cauliflower swap for rice-packed paella, right? Let your pals start the week well informed! Click "Send to a Friend" now.